And I had very little to work with. Typically, I&apos;m not a big makeup person. While I do wear it most of the time, my goal with it is never to do much more than make myself look presentable. I&apos;m basically just trying to get to a place where my appearance isn&apos;t distractingly awful. Things like smoky eyes and ombré lips are just beyond my comprehension. The one makeup area in which I have considered creating a full-blown look is my eyebrows. Mine are exceptionally sparse and I&apos;ve longed for dense, full brows even before Cara Delevingne&apos;s became a thing. 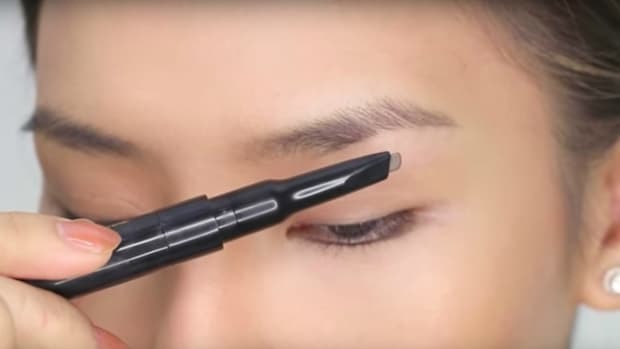 My search for perfect brows lead me to try just about every brow-filling product on the market (really), and I&apos;ve learned that it&apos;s not enough just to have the right tools -- you have to also know what you&apos;re doing. So, I searched YouTube for some advice. Seeing as how Lily Collins is pretty much my eyebrow icon and YouTube is full of tutorials that show you how to look like a celebrity, I decided to try one out that re-creates hers, specifically. This one by Tanya Burr has more than 600,000 views, so I figured it was a good one. The tutorial actually shows you how to create a full Lily Collins look, but the brow portion starts at around 2:00. Her instructions are simple and I found them easy to follow. It also helped that Burr&apos;s eyebrows, like mine, are naturally quite thin, so the main goal was not only to make the brows fuller and darker, but also much bigger, which can be difficult to do in a way that looks natural. Burr discovered, and I have to agree, that the key is making the brow thicker is to add some volume on the top rather than on the bottom. When I finished, my brows did not look quite as good as Burr&apos;s, but they did look a lot less insane than I expected. Here&apos;s a photo. And you can use your fingers to do most of it.